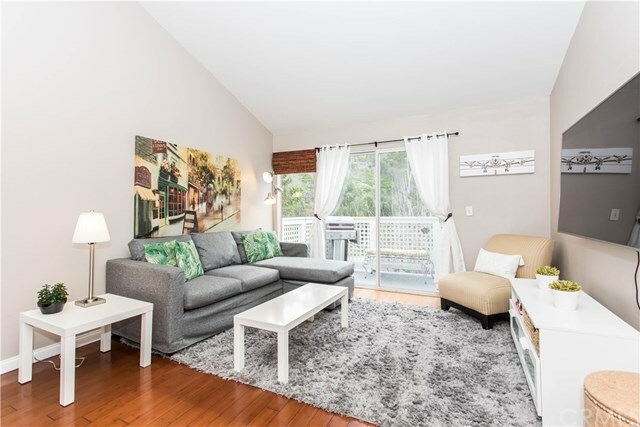 A turn-key, renovated 2 bed 1.75 bath condo located in Dana Point's Capo Beach. This home is located just minutes away from Doheny Beach and Capo Beach and features an open concept with vaulted ceilings, large windows, laminate wood floors and renovated kitchen and bathrooms. Walking in the front door you will notice how light and bright this home is with plenty of windows and access to outside living spaces. The living room area features laminate wood floors, vaulted ceilings and a large sliding door which opens up in a westerly direction to a deck made for entertaining, cooking or catching the beautiful Dana Point sunsets. Situated opposite of the living room is an open kitchen which is highlighted with rich wood cabinetry, granite counters, microwave, dishwasher, gas stove and breakfast bar; conveniently located next to a dining area perfect for entertaining. The guest bathroom has been renovated and features tile flooring, vanity and a shower which serves the guest bedroom with access to the main deck. Conveniently located between both bedrooms is a laundry room which includes a washer and dryer. The master bedroom is truly a retreat at the rear of the home with an adjoining master bathroom with tub, walk in closet and access to a private deck. Additional finishes include: ceiling fans in the bedrooms and living room, window treatments and upgraded baseboards. This home is conveniently located minutes from the beach, shopping, PCH, freeways and highly rated schools.